With Thanksgiving, Chanukah, Christmas and New Year’s just around the corner, you’re probably already looking at the calendar and starting to panic. Most likely you haven’t started your shopping lists, planned your menus, or even given the slightest thought to planning for next year. If this is you, your blood pressure is probably rising and your pulse quickening. Never fear! There is hope! Here are eight simple tips to avoid holiday stress and minimize the overeating of sweet treats. Hydrate. Often times we become dehydrated and don’t even realize it. Sweet cravings are a sign of this. Before you opt for a sugary indulgence, have a glass of water and then wait a few minutes to see if your craving doesn’t subside. Proper hydration also helps to keep us awake. If you are getting plenty of rest yet still find yourself yawning, drink a glass of water. Avoid soft drinks, even the diet ones. Soda is America’s #1 source of added sugar. A 12oz can of regular pop has 9 teaspoons of sugar. If someone took 9 teaspoons of sugar poured it into a glass of water with a dash of caramel coloring, would you want to drink it? I don’t know anyone who would. And all that sugar just gives you an immediate boost of energy followed quickly by a crash. Additionally, the diet soft drinks are just as bad in that artificial sweeteners interact with the chemistry of your brain making you feel hungrier. Minimize your caffeine intake. Too much caffeine can cause dehydration and blood sugar swings, causing cravings and mood swings to occur more frequently. Again, reach for that glass of water first. Caffeine might also impede getting proper rest so be sure to enjoy your coffee in the morning, not the evening, if at all. Eat fresh fruit and vegetables. Real food is healthy and delicious. The more you eat fresh versus overly processed foods, the better able your body will balance its energy. Move. Keep moving throughout the holiday season even if only with a simple activity like walking. Start with 10 minutes a day and gradually increase. It will help balance your blood sugar levels, boost your energy, and reduce tension. It might also help you avoid that pesky holiday weight gain. If you think you don’t have time, if you only move for 30 minutes a day that leaves you 23 ½ hours to do everything else. Get more sleep, rest and relaxation. When you are tired you become more stressed. In turn, your body will crave more energy, usually in the form of sugar. The holidays can be a stressful time if you’re balancing work deadlines, family obligations, shopping for gifts, etc. With plenty of rest, your body will have the energy it needs to “do it all” without added stress. Eliminate fat-free or low-fat packaged foods. These foods contain high quantities of sugar to compensate for lack of flavor and fat, which will send you on the roller-coaster ride of sugar highs and lows. You’re better off eating ‘real’ foods, especially for snacking, that are packed with nutrients. Examples of two healthy snacks are a ¼ cup of nuts, seeds, and raisins or 2oz of 70% or higher dark chocolate. Slow down and find fulfillment in non-food ways! You body does not physically need sugar, but it does crave hugs, time with family & friends, fresh air, workouts, massages, etc. When life becomes sweet enough itself, no additives are needed! Hopefully these tips will help you plan to nurture yourself this holiday season so as to minimize your stress levels and your desire to overeat. 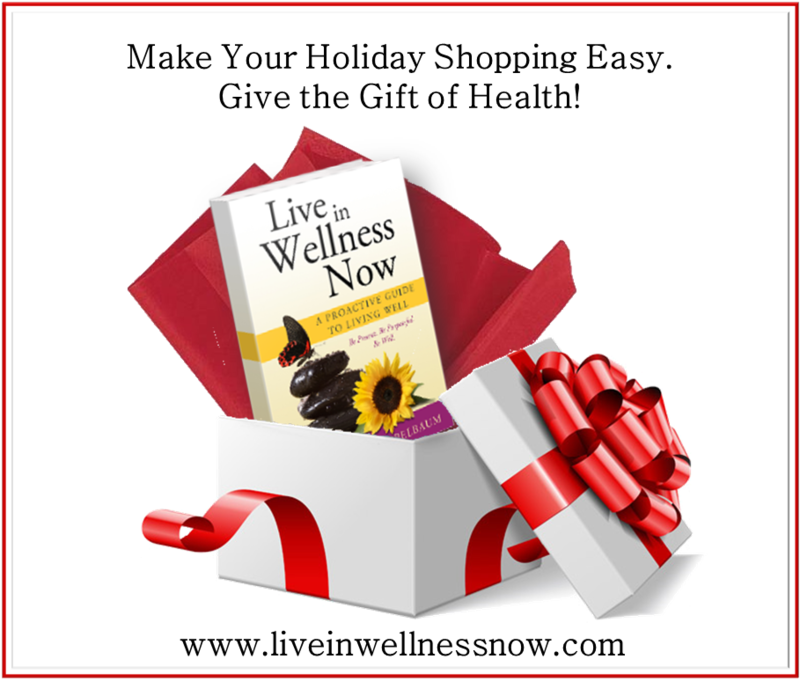 And to learn to be proactive in your health care versus reactive in your sick care today and always, purchase Live in Wellness Now; An Interactive Guide to Living Well. And stay tuned for details of my upcoming 4-week tele-class entitled, Design Your New Year where you’ll learn how to set yourself up for your healthiest year possible! More information coming in January 2014.